Madagama, also transcribed Medagama, is one of Sri Lanka’s most enchanting heritage sites, but almost unknown to foreigners and locals alike. 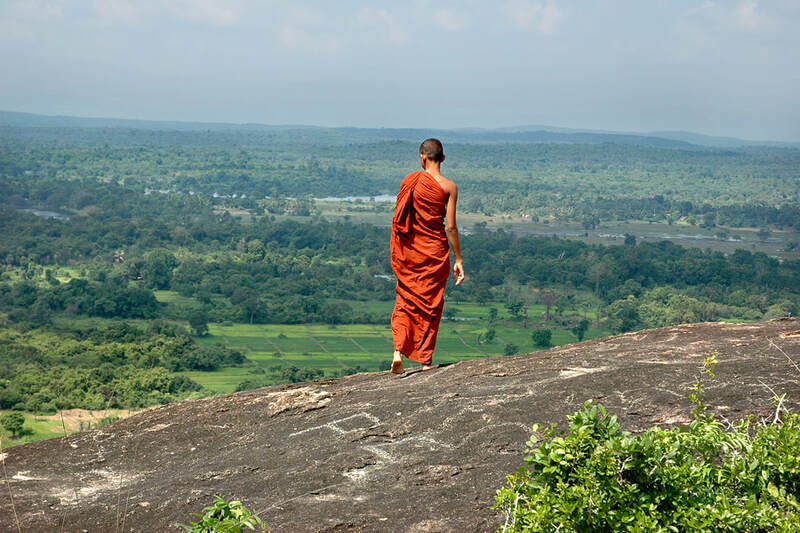 It’s one of the northern plain’s typical monadnocks inhabited by Buddhist monks already more than 2000 years ago. 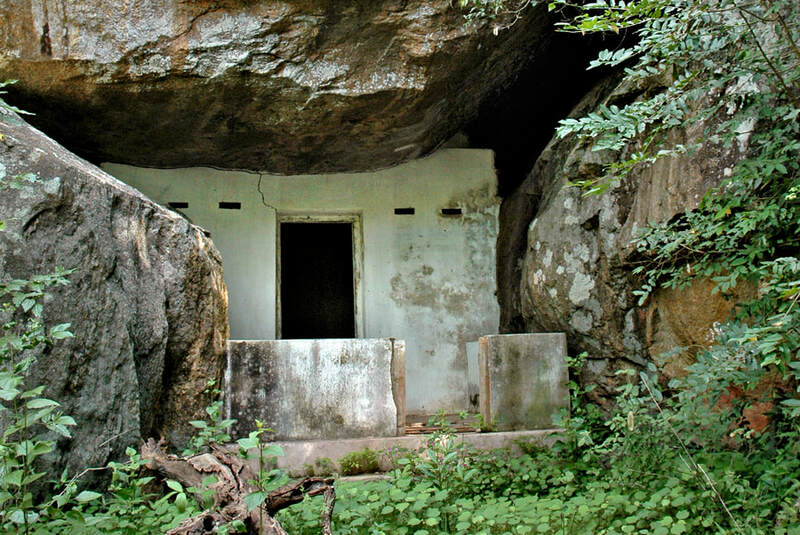 Though located in only 1.5 km distance from the Puttalam - Anuradhapura - Trincomalee mainroad (A12), a stop at this forest hermitage is included in almost no tourist itinerary, simply because its beauty has yet to been discovered by foreign travellers and it may be a little bit exhausting and tricky to climb the rock. During the civil war, this region was often unpassable for tourists. The rock of Madagama Kanda with its ancient Buddhist caves is an off-the-beaten-path destination par excellence, a genuine hidden treasure. For the rare visitors, the vistas are an unforgettable sensation. Madagama, belonging to the Horowpothana Divisional Secretariat at the eastern border of Anuradhapura District, is just halfway between Mihintale and Nilaveli Beach. It’s situated 63 km east-northeast of Anuradhapura and 47 km west of Trincomalee, in only 4 km distance from the town of Horowpotana (also spelt Horrowpotana or Horowupotana or Horowpathana). The full name of the ancient temple is Madagama Kanda Rahath Lena Aranya Viharaya, which translates to “Madagama Hill Saint Cave Forest Monastery”. The monastery is located at the northern base of Madagama Kanda. Natural rock shelters have been made habitable by carving a drip ledges into the ceiling to prevent water from pouring into the cave room. Some of the semi-caves, now protected by walls, are still used as dwellings of monks, serving as their Kutis. Others, still open, have small altars with Buddha figurines. 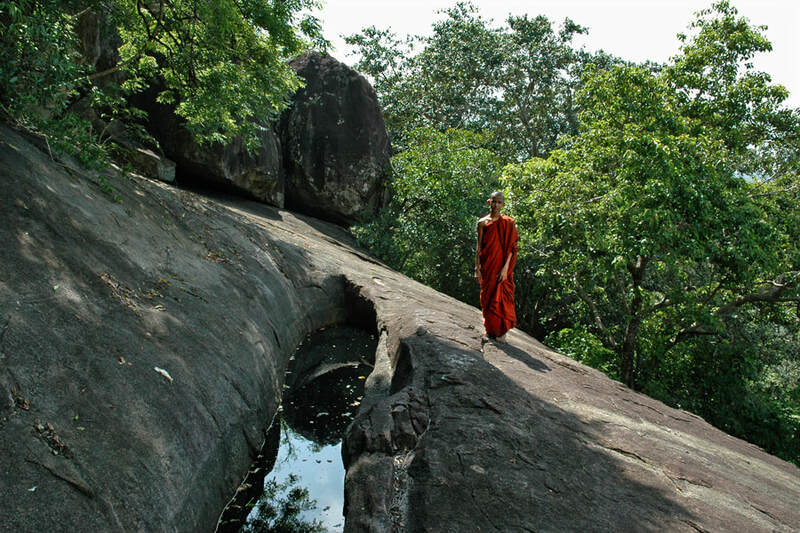 Usually, one of the monks will be helpful as a guide to find your way through the jungle. The 20-minute climb to the summit begins at the inhabited area of the monastery. The jungle path runs along small and verry narrow ponds, carved out from the rock and fed by rain water, collecting it from the uphill rock surface. They once served as wells and maybe bathes of monks. The bathes are said to be several meters deep, which appears to be an exaggeration. Small circular carvings at the edges indicate the spots where the monks drew water. Archeological research of the waterholeshas revealed elaborately carved tiles, indicating that the ponds were once sheltered by a roof. There are plenty of poisonous snakes in this area. Locals believe, that their bites will not be fatal, since this is a holy mountain with all inhabitants following the peaceful path of the Buddha. Actually, some villagers have survived snake bites on the Manakanda Kanda. However, on order to enjoy the rest of your holidays, better avoid to make similar experiences. The forest path leads to the summit, it is called the “windy peak” by locals, since there is always a breath of fresh air at the top of Manakanda, which reaches a height of aprroximately 80 meters above the surrounding plains. The vistas from the top is not as breathtaking as that from Sigiriya. But amidst a wide plains, the view is nevertheless unforgettable. This semi-arid jungle area is lush green only after the anti-monsoon season in November or close to tanks. However, many of those Wewas are partially dry during the peak of the local dry season end of August and begin of September. It’s a wildlife area cowded with raoming elephants. A small stretch of this typical dry-zone forest, covering only 20 square kilometres, has been declared Horowpotana National Park in 2011. It can be seen as a forested hill in the west. Another path winds downwards at the eastern side of the plateau. 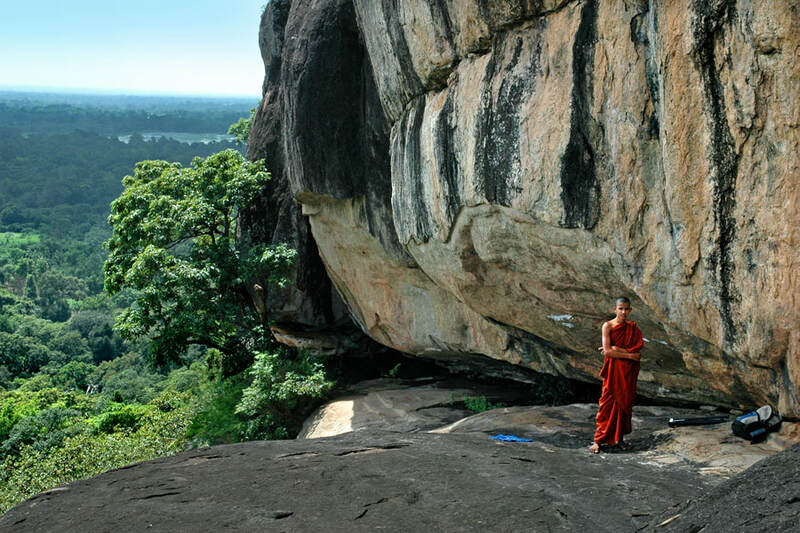 It leads to the most interesting ancient Buddhist caves, which can be seen on an elevated horizontal saddle at the steep southern slope of the rock. This picturesque terrace of about 100 m length can only be reached by climbing about 2 meters with the help of your hands. At the narrow western end, drip ledges again indicate former human habitation. Carvings can also be found on the ground, levelled and polished plain rock surfaces that are called stone beds. Buddhist monks, according to their canonical Vinaya rules, were not allowed to sleep in comfortable elevated beds. Stone beds, primarily found in the nothwestern area of Anuradhapura District, between Mihintale and Madagama, belong to the earliest Buddhist carvings in Sri Lanka. The most enchanting spot of this rock terrace and the entire Madagama area is a rock shelter of only one meter in height, which covers the calm miroring surface of a natural pond. It never dries out and always provides drinkable water, collected from the porous permeable rock oh Madagama Knda. The small pond is inhabited by tadpoles.